Although built as a temporary structure it did have gas lighting and seating for 800. The Theatre was run by its Proprietor Mr J. W. Snape junior, who also acted in its productions. Prices and opening times for the Theatre in its opening week can be seen in the contemporary advertisement shown right. 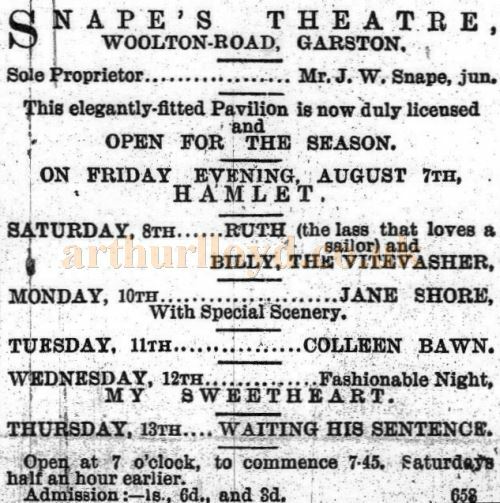 Right - A contemporary advertisement for the opening of the Britannia Pavilion, Garston, at the time called Snape's Theatre, in 1891 - Courtesy Paul Young. Some of the information on this page was kindly sent in by the Garston and District Historical Society. If you have any more information or images for this Theatre you are willing to share please Contact me.